You can have your Lombardi Trophy. Take your Lord Stanley's Cup and stick it. The Larry O'Brien!?!? Please. In my world one trophy reigns supreme, the Heisman Memorial Trophy. I'll give you a moment strike the pose in your desk chair. . .you good?!? December 12th, 2009. 8:00 PM, Nokia Theatre in Times Square. Okay, let's get down to business. Just a month away from crowning the newest Heisman Trophy Winner and the race is still wide open. As the 2009 college football season kicked off you knew the names. Returning trophy winners, Tim Tebow & Sam Bradford, alongside returning finalist, Longhorn Colt McCoy. There were some dark horses however. California running back Jahvid Best, coming off a monster sophomore season in which he rushed for nearly 131 yards per game including a Emerald Bowl performance where he notched 186 yards on twenty carries. How about Oklahoma State Cowboy super receiver, Dez Bryant? In 2008, Bryant caught 87 balls for nearly 1,500 yards which includes a 13 catches for 167 yard performance in the Holiday Bowl. With athletes like these, the 2009 Heisman Trophy race was bound to be a special one, wasn't it??? It was. Then '08 recipient Sam Bradford was hampered with a shoulder injury that would ultimately send him to the operating table and out of the Heisman Trophy race. Dez Bryant's quick start was halted when the NCAA suspended him for infractions that I'd rather not get into, the most dominant college football talent was out quicker than he was in. Jahvid Best has suffered not one but two terrifying concussions in a matter of weeks, the Cal running back is out. While McCoy & Tebow have stayed somewhat healthy and led their undefeated Longhorn & Gators squads to top 3 BCS rankings, neither has sewn up the Heisman Memorial just yet. So who can still make a claim? Who can join McCoy & Tebow in New York? Many questions still surround the most heralded trophy in all of sports. Mark Ingram, RB Alabama. The best the SEC can offer, this side of Tim Tebow that is. Ingram has the potential to become the first to raise this trophy in Tuscaloosa, Alabama. Believe that? In the storied history of Alabama Crimson Tide football, they've never had a Heisman winner. Let's get one thing straight, the only thing separating Ingram from the rest of Crimson Tide history is timing (read above). While I think Ingram is a fantastic running back, I'm not blown away and given the circumstances this season has presented us with, he's a benefactor. Ingram has the ability to close out games and protect leads. Getting first downs at the end of a game is huge, Ingram does that. He's got some numbers to boast about as well, 6.6 yards per carry, eight touchdowns, and 1,100 yards. Ingram has allowed the 'Bama offense to ignore their quarterbacks ineffectiveness. Furthermore he eats up yards when given the rock more than 20 times a game, his five 100+ yard performances have come when 'Bama does so. In must win games against South Carolina, Tennessee, and LSU, Mark Ingram rushed for 489 yards, they'd have lost one of those at least, without his ability to move the chains. Mark Ingram will be in New York on December 12th. 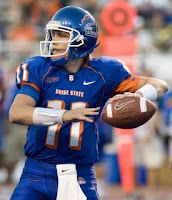 Kellen Moore, QB Boise State Much like his teams run at a BCS Bowl, Kellen Moore could come up short here. Moore is leading an undefeated team from a non-BCS conference to a Top 10 finish. For what its worth, he's very good. On the season, Kellen Moore has been very close to perfect throwing just three interceptions. His signature game may just be his first of the season. Against Oregon in their season opener, Moore didn't turn the ball over and completed 19 of 29 passes. Why is he a Heisman candidate? Moore is completing almost 68% of his passes and has already tossed 27 touchdowns with four games remaining. With Boise State as a team and with Kellen Moore, people can't back off of the lesser opponents theory. Yes, Moore has played against the likes of UC Davis and Bowling Green, but he's also stiffled an Oregon defense and ran up scoreboards (6 games of over 40+ points). Over the past five weeks Moore has impressed voters, five consecutive games of three touchdowns or more while averaging 270 yards passing per week. Moore might be a stretch for most voters but someone should show Boise respect, inviting Moore to New York would do that. 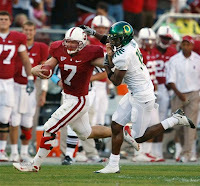 Toby Gerhart, RB Stanford It took Oregon getting dropped by Gerhart's Stanford squad for him to be noticed, but he is front and center now. Gerhart is a big, bruising, senior running back, at 235 lbs. When you watch this guy mash it up, it sends chills through defenses. With three games remaining, the Stanford running back has already chalked up 1,200 yards and 16 rushing touchdowns. In all but two of Stanfords nine games, Gerhart has gone over the century mark including going over 200 yards twice. In Stanfords dominating performance against Oregon, it was Gerhart who coudln't be stopped. 5.9 yards per carry, 223 yards rushing, and 3 touchdowns in their upset win over Oregon. Gerhart is been held out of the endzone in only one game this season, a game which he rushed for 82 yards. The PAC-10 is up for grabs as well as the Heisman trophy, so why isn't Gerhart's name in the conversation more? Because he doesn't play in the SEC? Toby Gerhart has twice as many touchdowns than Mark Ingram and two more 100 rushing games than the 'Bama running back. Could a masterful performance against USC vault Gerhart even closer to the Heisman race? Gerhart is the Stanford Cardinal offense, don't think so? Ask yourself why freshman Andrew Luck has been able to drop back and only be sacked six times this season? Because Toby Gerhart keeps defenses honest, they will run the ball and can pass. From The Readers . . .
You Can't Tell Me . .